"H'el on Earth": "Fast and Faster"
We begin with a flashback of an insectoid alien looking over the unconscious from of H'el shortly after he has landed on Earth. His master must be warned of this new arrival. In the present, the Justice League is attacking the Fortress of Solitude to stop H'el's plan to destroy Earth's sun and solar system in order to go back in time to save Krypton from destruction. Superman and Superboy have been transported to another dimension. Yet, the Flash has managed to vibrate his molecules to enter the crystalline Kryptonian home of the Man of Steel. His mission: to convince Kara Zor-El that H'el is only using her to bring his schemes to fruition, or take her away from him by any means necessary. Should the Fastest Man Alive succeed, Kal-El's comrades may have a new ally. If he fails, all life in the universe as we know it may be doomed thanks to Supergirl and H'el. Supergirl's battle with the Flash takes them through Superman's intergalactic zoo. Both combatants' respective abilities have given them an edge. Yet, a weapon in the Fortress used by the Flash powered by Kinetic energy gives him the upper hand as it scrambles Kryptonian biology. His victory is short-lived. H'el has made Barry Allen disappear. With the Justice League occupied with trying to get to H'el, and Superman and Superboy trying to escape the other plane of existence, there may be no way to stop the mad zealot as his star chamber nears completion. In another part of the galaxy, a reptilian alien race witnesses a sentience heading to Earth. This gigantic being's intentions are unknown. It could be a part of H'el's plan to go back to Krypton, or it could be trying to stop him. Whatever the case may be, Earth may yet be caught in the middle of some extraterrestrial conflict very soon. To Be Continued in Superman #16. Story - 4: H'el on Earth has been an interesting story arc. Like Adam Dechanel, I felt reminded of the crossovers of the past. It may not be Dead Again or Emperor Joker, but I feel compelled to read the next chapter, I'm impatient to see what happens next. That hasn't happened to me since Marvel's House of M.
I find myself on the fence about the last page of this issue. On one hand, I'm curious about what direction the Superbooks' writers will go with it. On the other, it seems to come out of nowhere and disrupt the pacing of the story. Until, I see future comics, I'll be in "Wait and See" mode for this book's conclusion. This isn't a perfect issue. There are some good character moments like the one where Kara sees Krypto. Yet, they are overshadowed by the slugfest between Supergirl and the Flash. That in itself had the potential to be great. Yet, it is merely a decent effort that feels rushed. It seems like Mike Johnson is trying to cram a script meant for an Annual into the monthly comic. 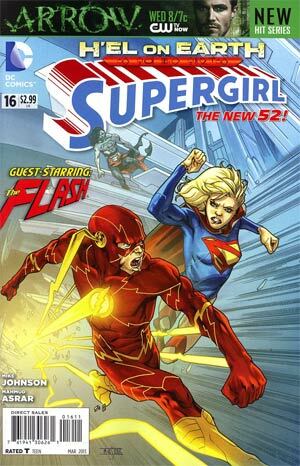 Supergirl is still one of the better titles in the New 52. Number sixteen just isn't as good as previous outings. Art - 4: Some visuals are rendered rather oddly. This is particularly true of the panels with Krypto. Other than that, Mahmud Asrar shows many f his strengths of science fiction/alien images. H's really giving this book a wonderful touch with his art. Cover Art - 5: This title has given us some cover images that have reminded me a lot of the ones I saw growing up in Ohio. I've enjoyed what's been done with recent issues. It's a pity more images do not do that these days.